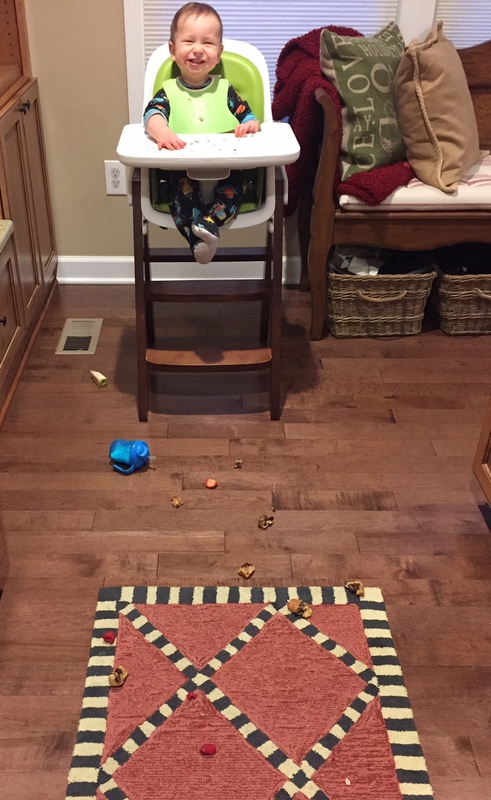 Feeding a child is one of the most stressful parts of parenting for me. One minute Joey is gobbling up a delicious sandwich with turkey, avocado, tomato, and cheddar cheese. The next minute he looks at me like I’m crazy when I serve him the SAME sandwich and before I can blink the food is launched across the dining room table. Is this behavior picky eating? I think so. I also think it’s him testing his limits with Mom and the laws of gravity like Bill Nye the Science Guy. From what I’ve researched and witnessed in my own kitchen, handling picky eaters is just another step in the parent-child relationship most if not all families experience. Be Patient. This one is tough for me- the impatient Mom! Did you know it often takes up to a dozen times for a child to accept new foods? Even if your child refuses a “bite,” encourage your child to touch and smell the new food. Talk about the color and shape, not whether it tastes “so good!” And don’t label them picky, at least not in front of your child. Children often accept a title like being “shy” or “picky” and continue to associate themselves like that. Either good or bad! 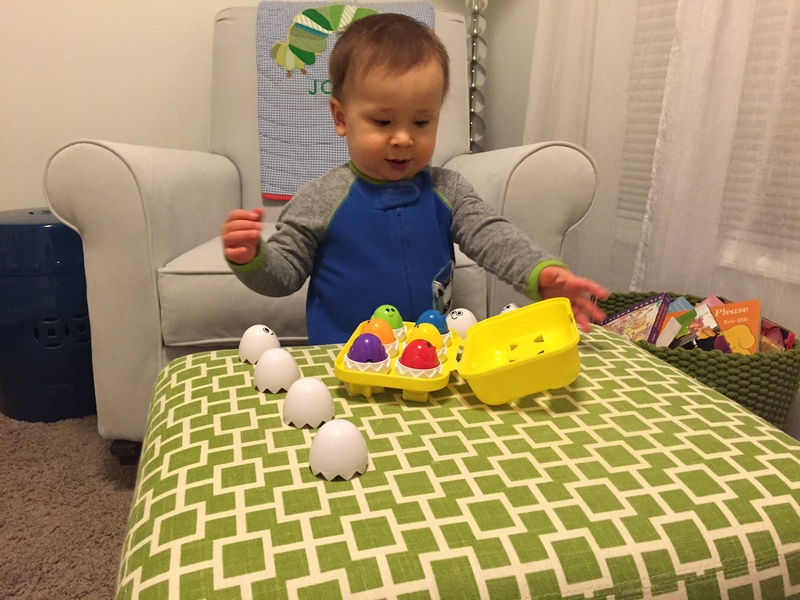 Joey might not like eggs, but he likes playing this egg matching/counting game! Avoid Sweet Rewards. Try to limit offering a reward or praise for your child to try the new food. We want children to choose foods because they like the taste and they are hungry. Not because they are going to be rewarded with ice cream after dinner if they eat their broccoli. Serve with the Familiar. Children are more likely to try a new food if it’s served with something they already enjoy eating. For instance, if your child loves pizza, make a build your own pizza bar with extra vegetable toppings for them to choose from. I know Joey LOVES bananas, so I’ll make sure he has a banana on his plate when I serve green beans or asparagus. Weird in my mind, but not in his! Green beans are served with the familiar: strawberries! Also pictured are chicken tenders with BBQ dipping sauce. Get the Family Involved. Take your children to the grocery store [when you aren’t pressed for time] and get them involved in the picking and choosing of different foods. When you get home, have them help you prepare a new recipe or food— better yet, have them help you name or create a whole new recipe from scratch! 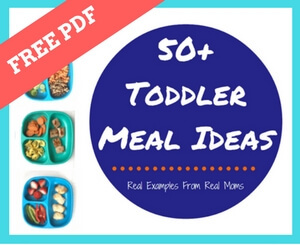 You can also have the older kids help plan your weekly menu and even help look for new recipes on Pinterest! While Mom cooks, Joey helps out in the kitchen too! 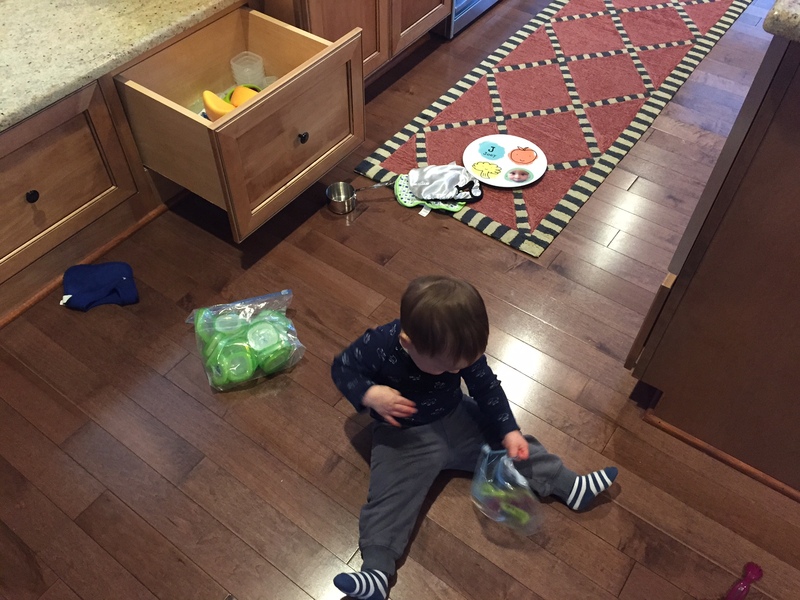 He has his “kitchen drawer” and has been known to make lots of delicious pretend recipes [aka a big mess]. Eat it Together. The best way to teach your child to enjoy healthy foods is to enjoy them yourself. Practice what you preach— oh and don’t feel bad if you dislike peas and never serve them for dinner. I grew up in a home where my Mother despised bananas. I don’t think I ate my first one until college. Now they are on my regular grocery list! Serve it THEIR Way. 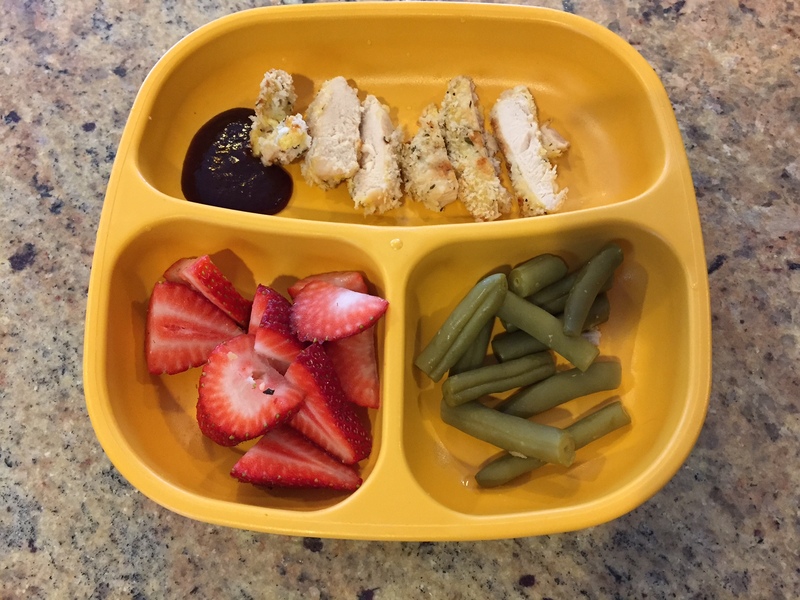 If your child doesn’t like their food touching, serve new foods on a plate that has sections or compartments. If your child likes dips, such as ranch or BBQ sauce, serve it alongside the new food even if you think it’s a weird combination. Or swap out the ranch for hummus or bean spreads. Don’t let this tip make you into a short order chef though. This is only if you have their favorite dips and spreads on hand! I’ve also been known to cut a cucumber 3 different ways in an attempt to get Joey to try it. You know what? He likes most raw veggies cut into strips! Not circles or chunks. Imagine that… [cookie cutters work great for this too]. 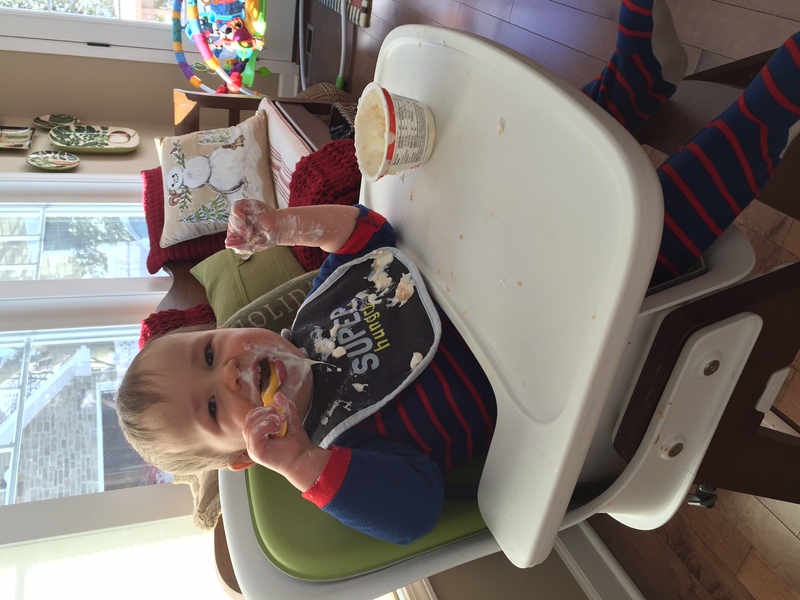 And let kids feed themselves… independence = messy! Respect Their Appetite. If your child isn’t hungry, don’t force a meal or snack because it’s mealtime for everyone else in the family. While it’s important to stick to a mealtime routine [meals and snacks at the same time everyday], sometimes children aren’t THAT hungry. However, this doesn’t give them a pass for leaving the table while everyone else eats. In the end, you need to do what works for your family. I encourage you to cut yourself some slack, as handling picky eaters IS stressful. You have the control on what you are serving your child, but ultimately it’s up to them as to whether or not they will try OR eat it. Easier said than done, I know. But if your child is growing normally and has plenty of energy, he or she is most likely getting the nutrients they need each day. Your tips are all great ones! I totally agree. This is such a complicated issue. I also would add that it is important to not make it a bigger deal than it is. Because then it becomes a test of control. I like to ignore the bad and reward the good. So when I see my daughters try something new, I praise them like crazy. But if they push the food around their plate I try to ignore it. Great conversation starter!! Exactly Katie!!! You bring up such an excellent point. I’ve noticed the more I use words like “no” the worse the mealtime situation becomes. Glad we can share these tips with one another! Excellent tips. As a peds RD, I am always excited for ideas from Moms! Sharing these with my patient’s parents! Thanks. Such great tips! I love that you recommend not having a sweet reward. In my opinion, that only teaches kids that the dessert is the goal and the real food is just something you have to push through and not enjoy. I also think that eating together as a family is so important. Even though mealtimes can be stressful with food going everywhere and kids being poorly behaved, it’s important for kids to watch their parents eat a variety of foods and to watch their manners. Exactly Elizabeth! And if we can’t eat dinner all together we try for a different meal in the day. For the very reason you bring up about the importance of family mealtime! Great tips! I especially love #1-so true! Although I wouldn’t label my own kids (now 13 and 11) “picky” eaters, they’ve definitely left me exasperated at meal time 🙂 I’m a big believer in continued exposure to new foods, but never forcing kids to eat them. Both my own kids wouldn’t eat salad until at least a couple of years ago, but now, on occasion, we’ll make a family meal of it (as long as it has my “special sauce”) and everyone’s happy! 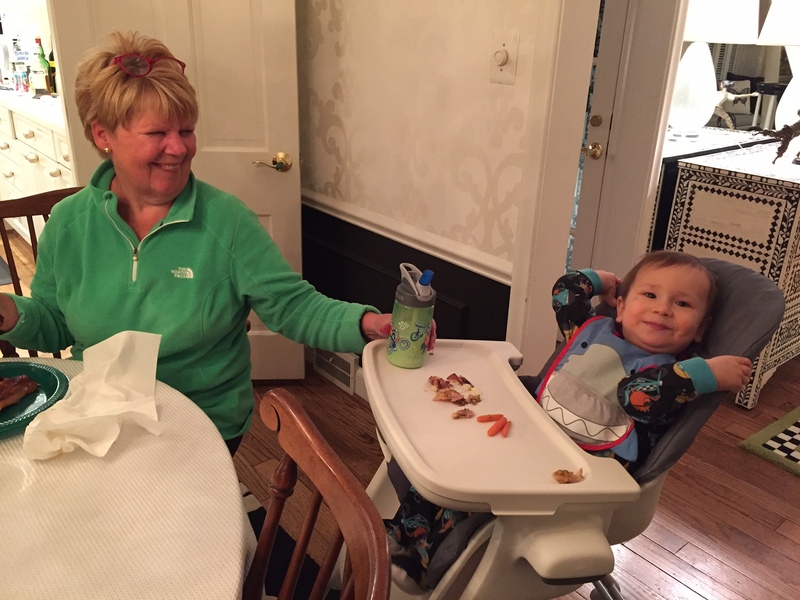 Thanks for sharing that you still tackle the struggle of picky eating at their ages! Ok and I have to ask: what’s the special sauce? Joey would love a new one!! Great tips, Katie! I love this topic. We’ve been talking to our kids about the importance of eating some foods that we don’t LOVE. If we only eat our favorites, there’s no variety. We all need to eat lots of food that we feel so-so about. Every bite can’t be smiles and chocolate cake if we want to be healthy. Another great post Katie! I couldn’t agree more with all of these! My parents are so guilty violating of #2. No matter what I say to them, their answer is that it’s part of a grandparent’s job to give ice cream and sweets. Arrghh! Oh Sonali… We go through the same thing here. They sure didn’t do that when I was little!! such great tips! I feel pretty lucky that my 3 year old girls are good eaters and haven’t been too picky (yet! Fingers crossed it doesn’t start) and even so, mealtime can be a challenge at times. Btw, love hearing that your mom doesn’t like bananas but you do. That’s one of the few fruits I don’t like, but I still get them and cut them up for my girls! They are so lucky to have you leading by example Jessica!! And my Mom won’t come in our house if she smells bananas. It’s that bad lol!